HOME / TRENDING / WHY THANK GOD BAPPA BY RITEISH IS THE BEST THING YOU WILL HEAR THIS GANPATI! 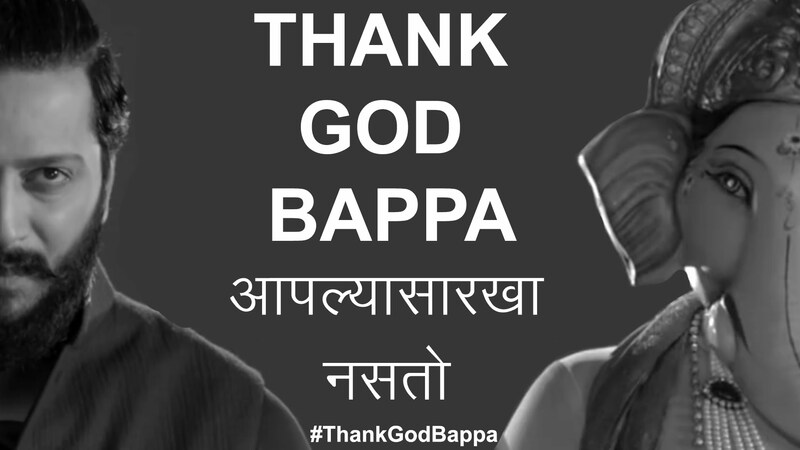 #ThankGodBappa! The rap sensation of the nation, we have to say.. wow! This video came out a week ago by Mumbai Film Company and Star Pravah starring Riteish Deshmukh and a bunch of kids dressed as Ganpati idols. And we are absolutely in awe of it! With visarajans started, this Marathi rap by Ritesh Deshmukh on Maharashtra’s favourite, especially Mumbai’s favourite festival, is now gaining much more momentum and that too for the right reasons! And..he nails it! Talking about the Ganpati business and post visarjan scenes on the beach, Riteish raps about how sad the festival is getting in the bigger picture instead of bettering things. People have made the festival a “dhanda” whereas the original idea was worshipping and taking blessings from the Lord. The video’s sarcasm level is too damn high and hits the right places too with it! It pin points every situation related to Ganesh Chaturthi in an extremely witty way. Questioning the division of Bappa in various unnecessary mandals, this rap is indeed the best thing you will ever hear this month! The look of the video is subtle too. It’s shot in black and white keeping the subtlety but also the importance of the message they are trying to put across. With music so good, the song is pretty catchy. The song is centered on how Bappa gets cheated every time by the people who bring him home or in mandals just for the “show” aspect of it, yet he smiles and visits us every year, without complaining! Not just the music and lyrics, but even Riteish, his look and acting is just perfect for the song. He does so well at rapping; and his expressions, on point. Period. All we can say is, everybody needs to watch this video right now, see if they agree and only then call themselves a ‘Ganesh Bhakt’ because..Thank God Bappa Aaplya Saarkha Nasto!